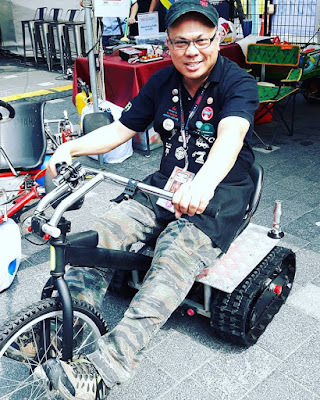 January 26, 2018 | ProgressTH Last weekend was Bangkok Maker Faire 2018. Local makers, students, teachers, and local businesses gathered to show off their latest projects and products. Everything from 3D printing and electronics to robots and virtual reality (VR) were on display. ProgressTH was represented as well, showcasing our latest projects including our newest opensource 3D printed DIYbio lab equipment, our portable tabletop hydroponics system, the latest results of our collaboration with Queen Sirikit National Children's Health Institute (QSNICH), our 3D printed rigid heddle loom, and a 3D printed Arduino-enabled USB volume control knob. All projects can be found on our Thingiverse account here. Several things stood out this year. One was the high level of awareness and knowledge among young students pass through of 3D printing, hydroponics, and 3D design. 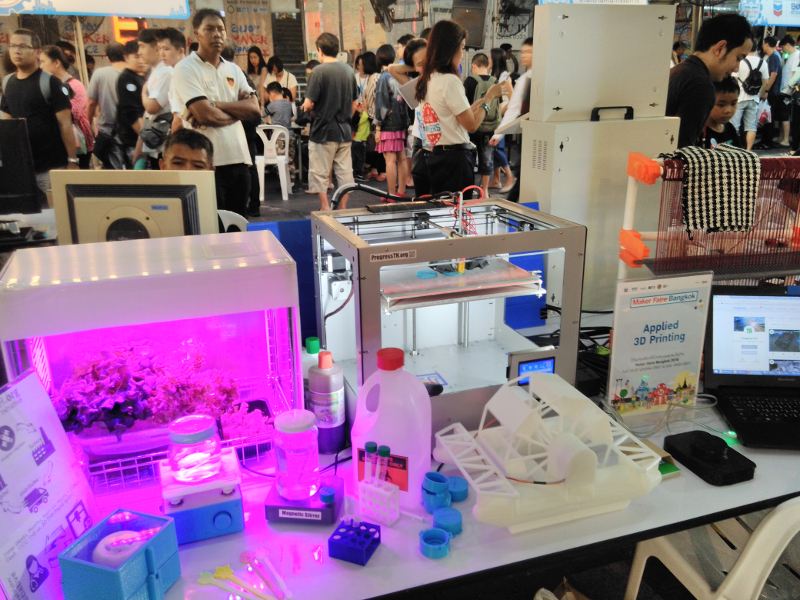 ProgressTH's Applied 3D Printing display this year at Bangkok Maker Faire. Another was the amount of 3D printing used in projects not necessarily featuring 3D printing itself. For instance, we saw a rescue robot with many of its parts 3D printed. Pleum of Meplus Hobby showed us some camera equipment he used 3D printing on, some of which you wouldn't have even guessed was 3D printed unless he told you. 3D printing is being used so ubiquitously now by local businesses, designers, and makers that its use is almost a footnote if mentioned at all. As usual, we didn't get a chance to see even half of what was on show this year. But we did manage to see a little bit between breaks in the crowds. 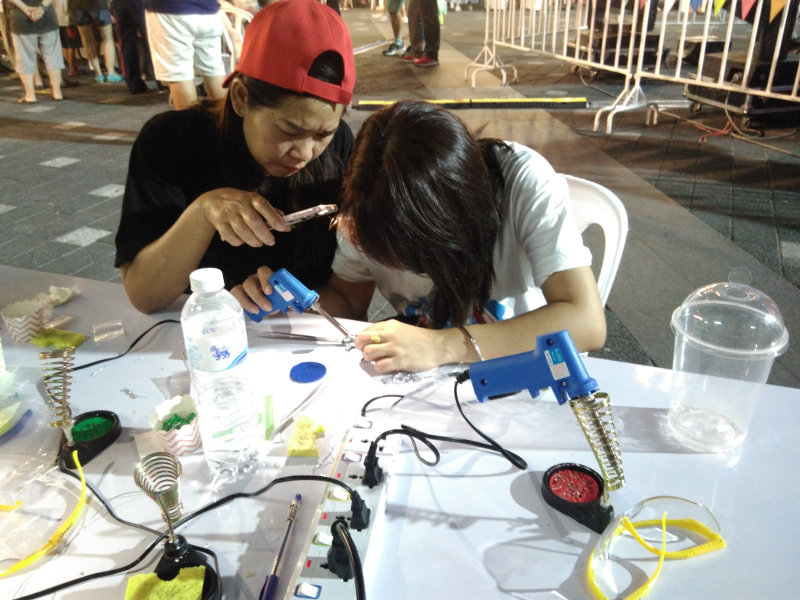 At Home of Maker's booth, many visitors got an opportunity to solder for the first time, assembling LED keychain kits. Home of Maker's booth was just opposite ours. They sold two LED keychain kits disassembled and had staff and equipment on hand to teach visitors how to solder them together. For many, this was their first opportunity to learn soldering and find out just how easy and accessible this technique really is. 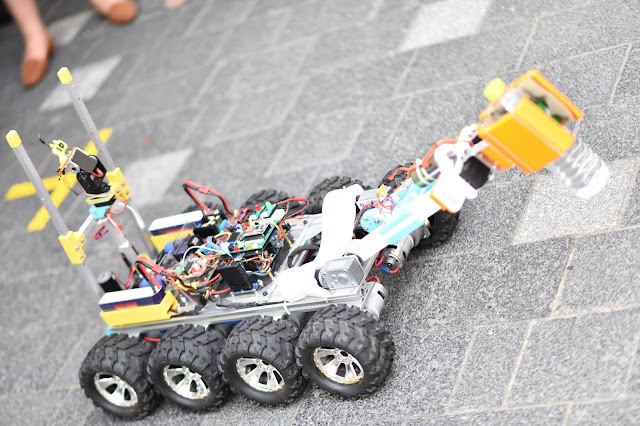 This rescue robot used a large amount of 3D printing, illustrating the fabrication technology's increasing utility in design and development. 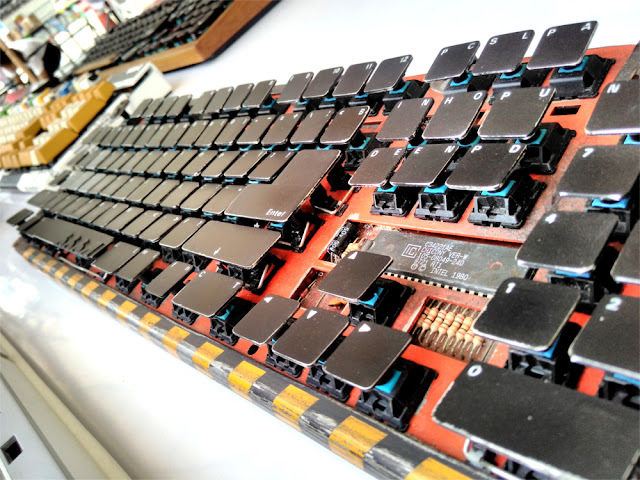 An architect by trade, 6664 mech Keyboard Mod (Facebook) uses his free time to make custom keyboards from everyday items. The keyboard pictured below uses aluminium rulers cut to size and painted to function as keys. 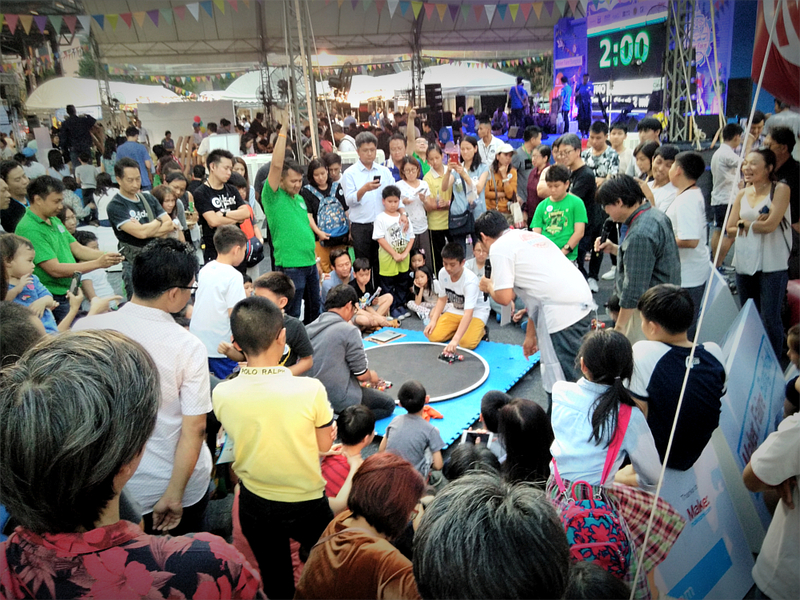 There were a variety of competitions at this year's Bangkok Maker Faire. We caught a glimpse at a sumo robot competition. Players place an automated robot into a circle which is programmed to find and attempt to push its competitor out of a ring. Nimit Hongyim, a maker specializing in custom electric vehicles showcased a collection of creative machines including an electric cycle with tank treads. His vehicles are powered by reclaimed batteries, often obtained from junkyards at huge discounts because the batteries are believed to be nearly useless. There were other EVs on display too, including a large three-wheeled cart and an electric longboard driven by a wireless hand controller. As EV technology continues to develop, we are likely to see many more such creations with greater capabilities in the near future. 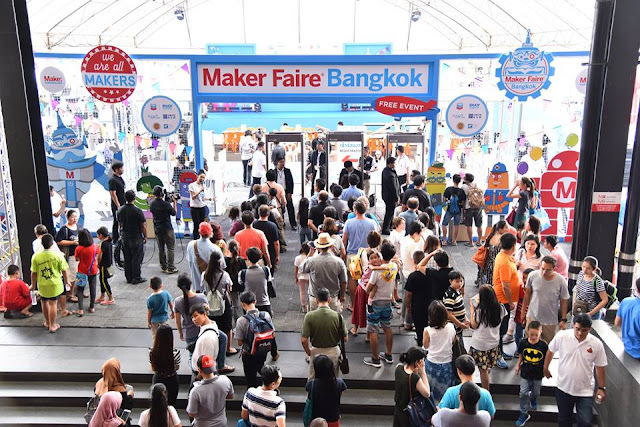 There were a number of vendors present as well, including 3D printer maker Siam RepRap, 3D printer retailer Septillion, ThaiEasyElec (who we bought some peristaltic pumps from for a future project), Gravitech Thailand, as well as larger companies like AIS and ASUS. Makerspaces including FabCafe Bangkok, Phuket Maker Club and Chiang Mai Maker Club were all there as well. Maker Faires and events like them are more and more common. If you get a chance to attend, you really should give it a try. There is such a wide variety of things on display that no matter what your interest is, you're likely to find something interesting and exciting to see and do. We would like to thank everyone involved in organizing the event. It ran smoothly, with professional staff setting up the event area, maintaining and cleaning it throughout both days, maintaining security, and assisting attendees and visitors alike. We would also like to thank everyone that attended, either organizing displays or the visitors themselves who brought curious minds, questions, and fresh ideas with them last weekend. Follow ProgressTH.org on Facebook here, Instagram here, or on Twitter here.